From one of Australia's bestselling and much-loved authors comes a sweeping, powerful story of a young woman who has to overcome terrible loss and trauma to find the courage to live life on her terms. Following the disappearance of her mother when she was just a young child, Drift has been raised by her father, growing up to work alongside him as an itinerant cattle drover along the beautiful coastline of remote Western Australia. It's a tough life, but nurtured and taught by two wise women - Wilma, a gentle travelling librarian and straight-talking Charlie, the legendary mobile saddler - Drift grows up to become a confident, idealistic young woman. But the world Drift lives in can be ugly and brutal. After a horrific sexual assault, Drift meets a handsome young stockman, but he is not all that he seems and she is drawn into a baffling world of lies and mysteries, centring on a lushly beautiful property called The Planet, run by a wealthy American woman. When Drift's father is hospitalised following a tragic accident and the young man she loves disappears, Drift has to find the courage to make her own way in the world. Drawing upon the deep well of women's wisdom taught her by Charlie and Wilma, Drift has to overcome heartbreak, betrayal, loneliness and pain in order to forge her path, own her truth, and create the kind of world that she wants to live in. Drift is a heroine to cheer for, and White Horses is a novel full of authentic Australian heart and soul, warmth and humour, as big and as generous as those wide-open skies in Western Australia. Offering a vision of a vibrant and thriving rural Australia based on Treasure's own experience and knowledge of regenerative agriculture, White Horses is both inspiring and captivating; another classic from the much-loved author of the iconic and bestselling novels Jillaroo and The Farmer's Wife. 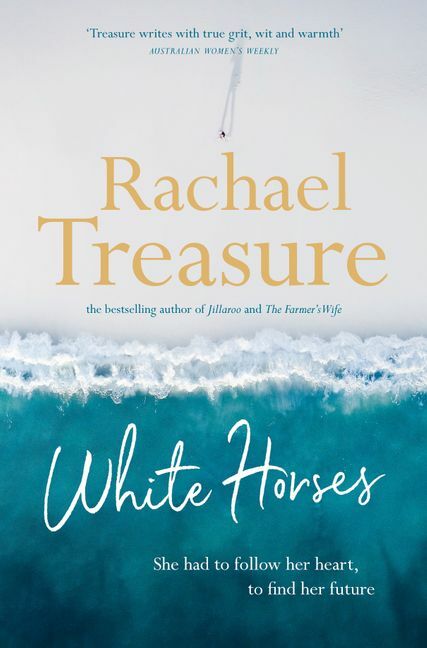 Rachael Treasure lives in rural Tasmania with her two young children and an extended family of kelpies, chooks, horses, sheep and a time-share Jack Russell. She is passionate about encouraging non-readers to read, as well as inspiring both farmers to consider regenerative agricultural practices and animal handlers to better understand their dogs and livestock. The author of iconic novels such as Jillaroo and The Farmer's Wife, she has been credited with inspiring the genre of 'farm lit'. All her novels have been bestsellers.